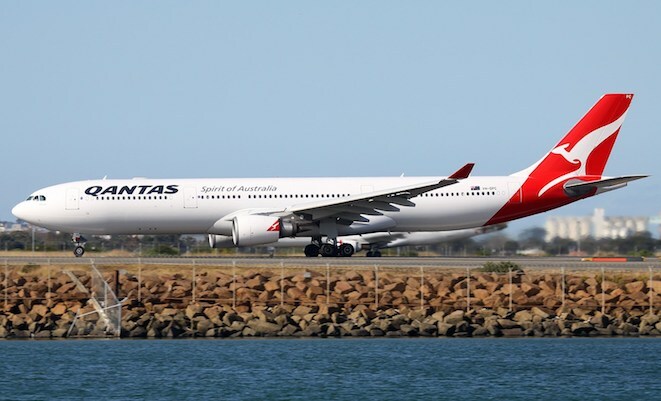 The first Qantas Airbus A330-300 has been repainted in the airline’s not-so-new corporate colours. Pictured here at Sydney Airport on August 4, A330 VH-QPC was repainted in the airline’s new colour scheme – first revealed in July 2007 – in Singapore, where it had undergone maintenance. The aircraft returned to Australia in the new colours operating QF82 from Singapore to Sydney on August 2. Qantas has 10 A330-300s in its fleet, VH-QPA-J, delivered between November 2003 and December 2005. What’s the difference to the old livery? New QANTAS text style and “Spirit of Australia” was placed under the Qantas logo. I don’t see any difference? The QF typeface should be in larger font across the from of the fuselage… it looks really small and out of place. The new livery has been around for a good 6 years which is why you may not be noticing the change. It is taking Qantas an extremely long time to repaint the fleet. The main differences are the new Kangaroo, the lack of gold stripe between the red tail and white of the fuselage and the new font. I am betting all the Virgin aircraft are rebranded before all the Qantas aircraft are completed. As I said should add the wings back to the Roo on the tail. I wonder what a AB330-300 would like like in the 1970s style that was 1st worn on the B747-238Bs Sorry bit of a flash back there !! I’ve never liked the new Qantas livery on the A330-200s, and I also don’t like it on the -300s. I think it looks good on all the other aircraft though. Having said that, I still prefer the older liveries. I vaguely recall the unveil of the new livery being mid 2008. Qantas still has multiple 737-800s in the ‘old’ livery. That means it’s been at least six years (working on my numbers of mid ’08) or possibly 7 since the aeroplanes have been painted. Of course, let’s not forgot the number of 767s still in the old livery too. If you look closely at the vertical stabilizer you with see a small unpainted (grey) area. John, the wings were QF weren’t they? I guess there’s not too many young ones out there that understand the “flying” concept?